*knocks on the monitor* HELLLOOOOOOOOOO ANYBODY OUT THERE??? Ok bro... you just made me spit soda all over my monitor! LOL Nope... it had nothing to do with the color! But Answer is posted with the question! Until next week all you happy rebels... may the force be with you, always! It was small enough on the hilt that it really could never actually be seen on camera... so it wasn't a big deal! I also believe Lucas was a big fan of his so he really didn't care, just as long as SLJ was in his movie! It's Monday and we all know what that means! It's time for a new Trivia question! That's right, the time of the week you all are waiting for and hoping that I don't stump you again! So, Let's get on with it shall we? The two youngest senators ever to serve in the Galactic Senate/Imperial Senate were women. Who were they? Although Riyo Chuchi gets close during the Clone Wars, she is at least a year older than the two youngest Senators — Mon Mothma (Bormea sector) during the Galactic Senate period and Princess Leia Organa (Alderaan sector) during the Imperial Senate period. Did everyone disappear around here? Q: The two youngest senators ever to serve in the Galactic Senate/Imperial Senate were women. Who were they? A: No idea. Cagney and Lacey? This was back in the days before they were drink-addled, broken-down, cynical, old cops with family problems. In their Senate days they were bright, young and upcoming representatives of the people out to make the galaxy a better place. And they took no guff from no man! LMAO! I do believe it was Paris (Hilton) and Nicole (something or other) seen above. This was them reading the rules of trade and commerce as well as the galactic Senate handbook. WOW... another easy one that I thought everyone would get... But I love the guesses LOL... Answer posted with the question... until next week everyone! May the force be with you all! Good Monday morning all you happy Rebels! It's trivia time again, and since I feel as if I've gone hard on you guys the past few weeks, I figured, I'd give ya an easy one this week and give ya a break. Let's get on with it shall we? 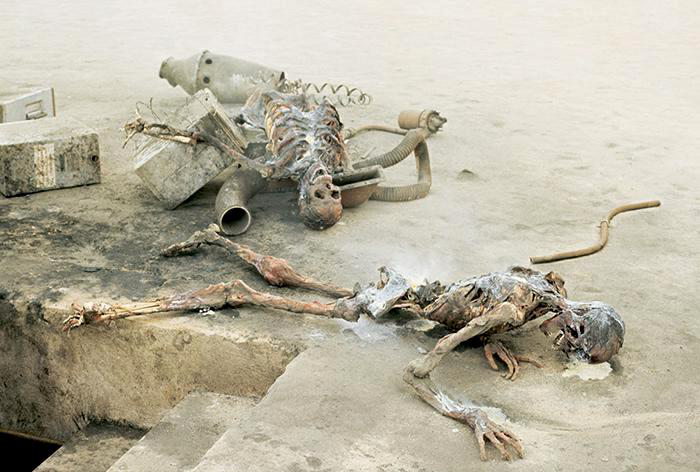 What langauge did Aunt Beru ask Uncle Owen to make sure the protocol droid spoke? Bocce - When we're first introduced to Luke Skywalker, he's about to run errands with his Uncle Owen with the visiting Jawas. Aunt Beru calls him back to remind him, "tell Uncle if he gets a translator make sure it speaks Bocce." Good thing it turns out to be like a second language to the over-qualified C-3PO. I'll come out of hiding. Spelling count? Batchi? Bacci? Bachi? Bachy? Bachee? Bah-che? "Tell your Uncle to make certain it speaks Bautchi." Well, I think he is right BUT that doesn't mean I can't put a completely crazy answer just for fun. Beru yells to Luke to make sure they speak bachi, unfortunately he is a rather sloppy teen with his mind on other things and he ask if they can speak hibachi. Thus later in the movie we get a cooked Owen and beru, all because of a verbal mixup. LOL Bryguy... I like the hibaci answer... even thou NO ONE spelled it right, I gave it to CU for GPs! Until next week rebelscum... may the force be with you always! Good Monday all you happy rebels out there... I'm feeling generous this week, so I'll take it easy on you all. This should be a relatively easy question! So let's get to it. What character had the first speaking line in the Star Wars franchise? C-3PO - His line: "Did you hear that?" C-3PO: "Did you hear that?" Knew this would be an easy one... you got it CU! Until next next week... may the force be with you all! Well, we do have blaster fire prior to that line. So one could argue that blaster fire is the language of the blaster. 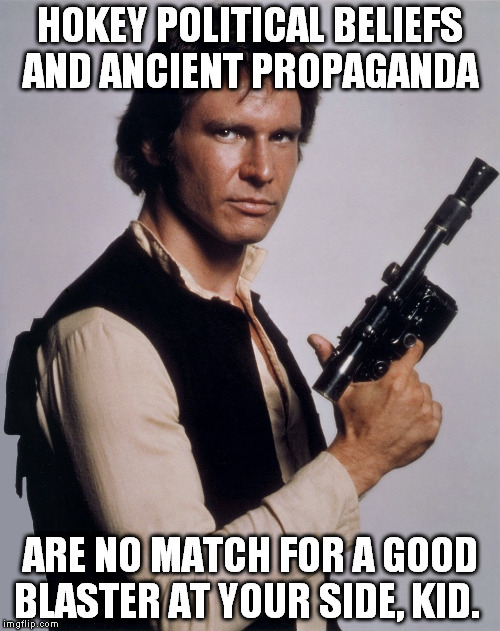 I think Han Solo would agree. And even Disney realizes that the language of a blaster is something they don't stand behind. And yeah, I realize i am reaching and don't have a real valid argument, but I didn't even get a chance to log in and post a funny answer this time. What were the shipping titles of Episodes 1, 2 and 3? The shipping title of Phantom Menace was "The Doll House", Clones was "Cue Ball" and Sith, "The Bridge". In early this time so I don't get left out. You mean like phantom menace, attack of the clones, revenge of the sith?? Or do you mean what original trilogy guys called them? Crappy crappiest, and less crappy but still crap. Not to be confused with the "special" editions...aka George's mistakes. 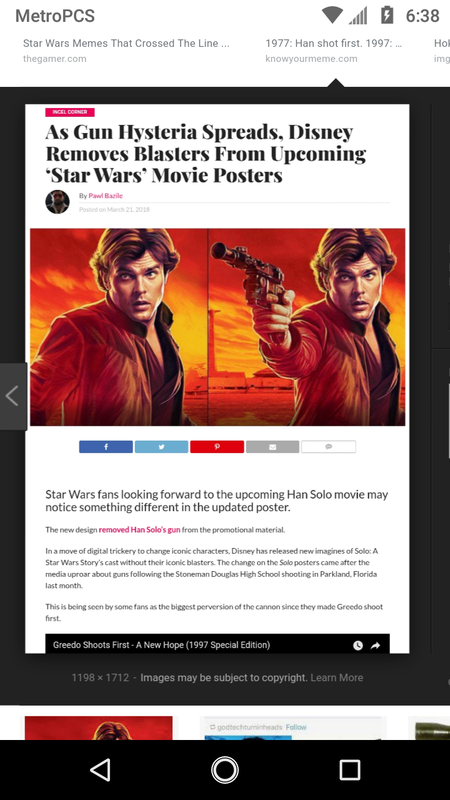 No... a shipping title is what they use to name the movie while it's being produced as to not leak any information out or cause suspiscion (like Return of the Jedi during production was called "Blue Harvest"). Stumped me for sure. Not hard to do, especially with prequel info. Subject: Re: Star Wars Question of the Week!